The Republicans running for County Executive in adjoining Westchester and Rockland Counties want to make it clear to suburban voters thinking of sitting out this year's uninspiring local elections: they believe stakes are higher than usual. "Whole neighborhoods have been laid bare and transformed into mere shells of their former beauty," says Rockland County legislator Ed Day, vowing to stop a spate of zoning changes permitting more multifamily construction in Monsey if he wins the county's top elected post. Across the Hudson in Westchester, County Executive Rob Astorino also stands stalwart against housing changes. "The federal government has sought to dismantle local zoning," he says with the intensity of someone who would stand in the schoolhouse door to stop it. His warnings are ominous; in a Wall Street Journal op-ed he asked "Do you think it is a good idea to give the Department of Housing and Urban Development unchecked power to put an apartment building in your neighborhood?" It's (relatively) fiery rhetoric from men in suits who seek to spend their days negotiating contracts with public employee unions, deciding whether to spray aerial insecticide to combat mosquito-borne West Nile Virus and denouncing the MTA. But to students of New York's tangled web of municipal jurisdictions, these campaign declarations are simply incoherent. State law denies its county governments a determinative voice in zoning matters. Town and village governments regulate the use of land as they please. But if these conservative Republicans are going to buck a tidal wave of growing Democratic Party enrollment in New York City's northern suburbs, they will need to pry large chunks of Democrats from voting the party line. So they declared a culture war. For those in the know, Day and Astorino appear to speak in code. Everyone knows Day is talking about stopping the construction of more apartments for the rapidly increasing number of Rockland Hasidim. Astorino is defending affluent communities' rights to prevent affordable apartment housing in their borders--the kind of housing required by a 2009 federal court settlement in which Westchester admitted its local zoning laws were discriminatory. The affordable apartments would be welcomed by the county's less affluent Latinos, whose local population has increased by nearly 50% since 2000 according to the United States Census Bureau. 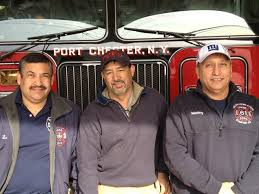 According to Bureau, the Latino population varies widely within Westchester - Scarsdale is 3.9% Hispanic; Port Chester is 60%. More than one of every five Westchester residents identifies as Latino or Hispanic. While moving uniformly to the left in state and federal elections, suburbanites have been less quick to throw in the towel on their local GOP. Astorino knocked off Democratic icon Andy Spano four years ago. Republican C. Scott Vanderhoef won his office in Rockland in 1993 and has served since, easily clearing his Democratic adversaries. The Republican future in Westchester and Rockland looks less bright. According to the New York State Board of Elections, only 23% of Rocklanders currently register Republicans. Among county voters who choose to register in a political party, 60% go with the Democrats. Groups that vote heavily Democratic, such as blacks and Latinos, are the fastest growing slice of the Westchester electorate, which now boasts over a quarter-million Democrats. Data from the Westchester County Board of Elections shows Republicans there in a losing battle with those who opt for no party at all. 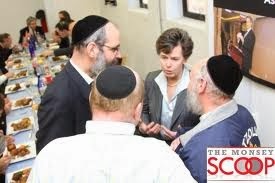 Rockland's large Hasidic families tend to support local Democrats who favor social service spending. In both counties, the heated Republican rhetoric on zoning in this year's campaigns has allowed the Republican aspirants to expand their political base. Polling shows Astorino stubbornly hanging on to a chunk of the affluent, apartment-averse Democratic voters that his opponent, Noam Bramson, needs to win. Day forged an alliance with Preserve Ramapo, a group opposed to Hasidic development that is led by Democrats who nearly dethroned the party's elected local chair. Astorino continues to blast the federal discrimination charges and remains a close favorite to win despite a disciplined campaign by Bramson. 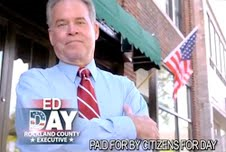 Democrat David Fried should also be in a cakewalk in Rockland where Democrats have a 2 to 1 voter enrollment edge -- but some of his party members have defected because they think Day takes a stronger stand against the Hasidim. The race is tighter than it should be. Party leaders have noticed. 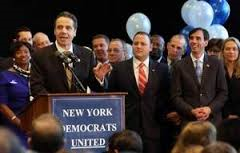 Governor Andrew Cuomo, the titular head of New York's Democrats, has joined leading party figures like Bill Clinton and Chuck Schumer in working the 'burbs, urging Westchester and Rockland Democrats to unite behind the party's nominees. There is a vein of anger that runs beneath these manicured lawns and Hudson River views. Resentment about outrageous property taxes funding high cost programs for new immigrants in the public schools. Disbelief at soaring public Medicaid costs scarcely offset by any cost-sharing with recipients. Shock at why the fastest growing ethnic groups in the county don't crave single-family homes, spaced as far from each other as money allows. The half-acre lots of the suburbs are the immigrant generation's revenge on the teeming tenements of their youth. While many neighborhoods slowly transform over time, the increase in the size of the Hasidic community in Rockland's Ramapo is staggering. Hundreds of new large, multi-family housing units came to market in recent years, accompanied by dozens of shuls and yeshivas. A recent survey of American Jews by the Pew Research Center unsurprisingly found declining synagogue attendance among members of the tribe; in Monsey, however, ever increasing ranks of rabbis never seem to lack for new adherents. A household of 10 may even bring down the average family size on some streets. Day has vocally amplified (some say exploited) the voice of residents of neighboring towns who worry about spillover traffic and drainage from all the building. Hasidic control of a local school board inflames relations between the Hasidim and black leaders, with public school programs facing unsustainable cuts. Some African-American leaders are openly breaking with the Democrats and supporting Day because of his perceived opposition to the Hasidim and their stewardship of the primarily-minority East Ramapo School District. Among the 15,000 odd votes to select the Democratic standbearer in a September primary, Day only secured a few hundred ballots as a write-in candidate. But he makes no bones about his General Election attempts appeal to Democrats opposed to the Hasidim, regularly holding press conferences with the handful of rebellious Democratic officials who have endorsed him. Change does not come easily to suburbia. Yonkers grabbed the front pages twenty-five years ago for refusing to integrate its schools-- a decade and a half after some Southern communities had made more progress. It took the federal courts to throw out an election district system in Port Chester that denied Latinos representation in the community's government. Airmont, in Rockland, was forced to change its zoning ordinance by Justice Department decree in the 1990s. Its laws unlawfully discriminated against Orthodox Jews. More recently, the Department of Housing and Urban Development charged Westchester with systematic exclusionary zoning-- a conspiracy by more affluent, heavily white municipalities to keep blacks and Latinos out of their neighborhoods by enacting zoning laws that prevented the construction of higher density affordable housing. Astorino's predecessor settled the case in 2009 and committed to constructing 750 units of affordable housing. That's not enough for the federal monitor administering the settlement; he wants each municipality in Westchester to ensure its local zoning ordinance permits multi-family housing. Astorino has battled that demand at every turn, claiming that the county cannot compel local governments to changing their zoning (absolutely true) and that the federal government has no basis to claim that the exclusion of high density development from the most attractive parts of expensive Westchester towns amounts to discrimination (debatable). A half dozen Westchester communities are targeted by the feds for additional zoning changes. The communities Astorino is spending so much political capital defending from this federal onslaught are not his partisan base. In Lewisboro (4.4% Latino, according to the census) Democrats outnumber Republicans. Pelham Manor (7.2% Latino) just elected its first Democratic Mayor. Democrats dominate in Scarsdale (3.9% Latino). Republicans do have the edge in Harrison (11.7% Latino). But some of those affluent Democrats embrace Astorino for defending their local zoning. In truth, it's also gratitude for delaying integration. Veterans of town and village meetings in racially homogeneous communities have heard it many times: one affordable housing development can become many. An ethnic food store can become a loud hangout. The Democratic candidates are aware that their adversaries have struck a nerve -- albeit on issues that the county executive is fundamentally powerless to do anything about. Bramson, the mayor of ethnically diverse New Rochelle, blasts Astorino's messy public spats with HUD but insists he won't roll over for the federal government. Some Westchester Democrats aren't so sure. Day's opponent, David Fried, has been a consistent critic of overdevelopment, albeit without divisive rhetoric. He definitively rejects a desalination plant proposed by the local water utility on the Hudson Shoreline and is backed by the Sierra Club; Day appears to have left himself room to ultimately back the controversial plant. Nonetheless, some progressive environmental activists cast their lot with Day, forsaking their views on abortion rights and marriage equality in exchange for political promises on limiting Hasidic development. Day can bring little more than a bully pulpit to Ramapo's zoning issues and Astorino has no say over whether Westchester towns and villages choose to permit more affordable housing. But both Republicans channel defiance in the face of change, endearing themselves to Democrats anxious about their communities' ethnic futures. These suburban Republicans will not stop the changes they bemoan. But they may win their elections anyway. David Fried opposes the high density development of Patrick Farm, will address Medicaid fraud and would not consider the East Ramapo School Board as stewards.....racists maybe but not stewards! !